Audinate is delivering on its vision of a truly integrated, easy to use and interoperable AV experience. Dante AV brings to IP video all of the benefits of Dante, such as discovery on the network, ease-of-use and integrated control. In addition, the Dante AV module ensures complete interoperability with more than 1600 Dante-enabled audio products already on the market. It also solves time alignment issues and eliminates the need for audio de-embedders in applications such as sports bars, live events and multi-zoned AV systems that often see lip sync errors. Audinate said that Dante AV solves problems of networked video and audio synchronization, utilizing a single network clock for sub-microsecond accuracy. Audio and video signals are independently routable in a single, easy-to-use interface using the Dante Controller software. Manufacturers can also take advantage of the Dante API to customize their management user interface. The Dante AV module ensures interoperability with more than 1,600 Dante-enabled audio products already on the market. The Dante AV Module supports one video channel and 8 bi-directional channels of uncompressed Dante audio. It’s ideal for manufacturers creating 1G video-over-IP products and includes Dante control, transport and synchronization. The architecture is completely codec-agnostic, so manufacturers can use the codec of their choice and still get the benefits of Dante. It's available with the Dante AV Product Design Suite, providing a complete AV-over-IP endpoint product design for manufacturers that wish to quickly get a product to market. The Product Design Suite incorporates the Dante AV Module and includes a comprehensive set of hardware documents and software to create complete, fully interoperable AV products quickly and reliably. The Dante AV Product Design Suite includes a JPEG2000 codec supporting 4K/60 4:4:4 video for visually lossless results with low latency over a 1Gbps network. The Dante AV Product Design Suite also implements HDCP (High-bandwidth Digital Content Protection) to prevent copying of digital audio & video content as it travels across connections. The Dante AV Product Suite can be easily customized to suit an OEM’s specific requirements and provide competitive differentiation. 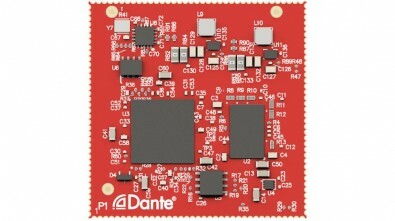 The Dante AV Module will be commercially available to manufacturers in mid-2019.